First, I spend time teaching students how to set a common table setting. To see what students know, I do a Play-doh Sculpture activity. Students are placed in groups and must present the correct way to set the common table using a napkin, knife, fork, spoon, plate and glass. Each group must create the place setting from play-doh on a white board with in 5 minutes. Each group presents their board and then students vote on which group(s) is/are correct, if any. We discuss easy clues to help them remember: fork=4 letters, left=4 letters, knife, spoon & glass=5 letters, right=5 letters. The knife guards the plate or alphabetically, k comes before s,and the glass sits above the knife/spoon. The napkin can have many homes such as beside the fork, on the plate, above the plate, in a glass, folded in half or creatively in a shape like a crown or swan. Next, I show them the Pretty Woman Restaurant Scene clip and ask students to identify as many things as possible that she does incorrectly. We discuss them and I give them brief notes to help Miss Vivian or themselves if they find themselves in such a situation. The notes include: #1: Watch What You Say…Think First! We talk about how this includes slang terminology, verbal manners and also topics of conversation. #2: Follow Others’ Lead. If you are unsure how to eat something, use a tool, tip, etc., then watch what others around you are doing and follow their lead. We talk about what can be acceptably eaten with fingers and what needs to be eaten with silverware. #3: Don’t Draw Attention to Yourself. Mistakes may happen and if they do, keep your reaction/response low key so you don’t have all eyes looking at you and whatever occurred. Down play it, apologize if necessary and move on. In addition to discussing what Miss Vivian did wrong, I spend time discussing basic do’s and don’ts when it comes to manners as to keep inappropriate manners to minimum. Since Miss Vivian is eating at a restaurant, we talk about the word “gratuity” and what it means. I demonstrate how to calculate tips, based on the cost of the meal and the service received. We do a couple examples together to review the math. 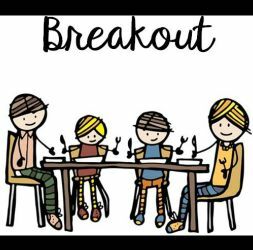 Prior to the Breakout Review Activity, I do explain to students the gist of breakout games and what they need to do because the breakout can take up the entire period. I give students 30 minutes to complete this challenge and breakout the final prize box! I will also assign groups ahead of time to keep the playing field level, but I don’t reveal the actual groups until the day of the breakout. Set up all boxes, contents for each box and codes for combination locks ahead of time. Organization is key to these games. You will need one Ziploc or Plastic food container for each group and 4 boxes/combination locks for each group. I usually have 4 groups of 3-4 students so I have 4 plastic food containers, 16 boxes, 16 combination locks and 1 large prize box with lock/key. I also number and color code each group. For example one group is red so all the numbers for the boxes 1-4 are in red and then the next group is green and so on. 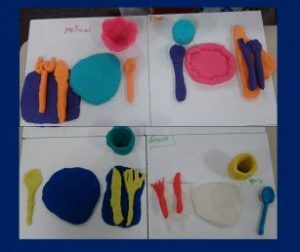 For the initial challenge, students must set the table correctly, using the provided pictures: plate, napkin, glass, knife, fork and spoon that are in the box. If they do it correctly, the code will work to open the next challenge box (See attachments). The next challenge involves students identifying the proper way to eat the listed food items. Students must decide if it should be eaten with their fingers, fork, spoon or knife. Again, if they do it correctly, the code will open the next box. If not, students must figure out where they went wrong and try again. The third challenge requires students to unscramble the top ten manners and then use the information to complete the true/false statements that follow. Again, if done correctly, the code will be revealed to open the next box. The fourth challenge requires students to use their math skills and calculate the tip amounts for each problem. You may allow calculators or let them figure by hand…your decision. Students must bring the answers to me to check and only the first group to have all of the answers correct will earn the key to open the prize box. Note: I did this breakout with junior high students and they were able to breakout within 30 minutes. Students must continue to work on and complete their challenges even if the breakout was won by another group because I use it as a review. I like to tell my students a story of how knife, fork, and spoon went to a party. They got into an argument and fork left because knife and spoon were right. That’s cute! I’ll have to remember to share that one with my students!